Zofran (ondansetron) is a prescription anti-emetic medication approved by the U.S. Food and Drug Administration (FDA) in 1991, to relieve nausea and vomiting in patients undergoing chemotherapy or radiation treatment, and the drug is currently manufactured by GlaxoSmithKline. Zofran belongs to a class of drugs called 5HT3 receptor antagonists, and works by blocking a neurotransmitter in the brain called serotonin, which triggers nausea and vomiting. 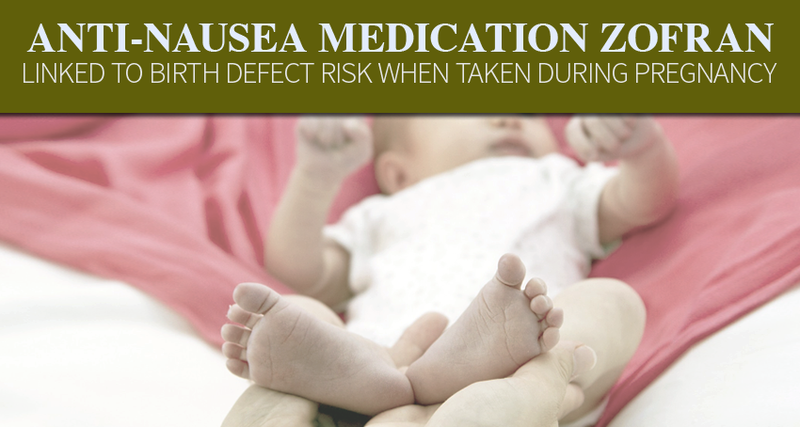 Despite the fact that Zofran has never been approved for use in pregnant women, the anti-nausea drug is commonly prescribed off-label as a treatment for a severe form of morning sickness called hyperemesis gravidarum, which can lead to malnutrition and dehydration. 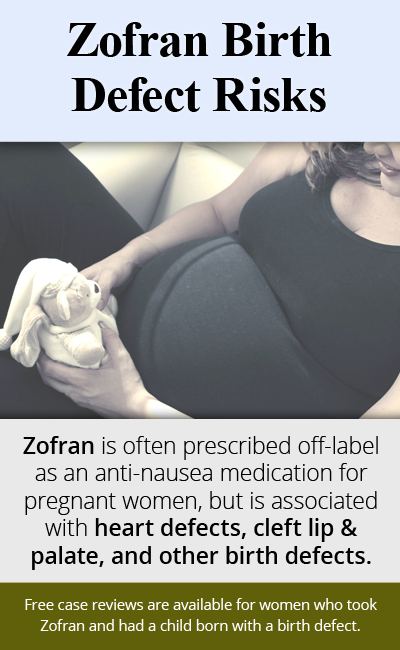 Unfortunately, morning sickness is most common during the early stages of pregnancy, and research shows that pregnant women who take Zofran to relieve nausea and vomiting may have an increased risk of giving birth to babies with severe birth defects. A number of recent studies have explored the alleged connections between maternal use of Zofran and devastating birth defects, including one notable study published in the journal Reproductive Toxicology in December 2014, which found double the risk of “hole in the heart” birth defects in babies exposed to Zofran during the first trimester of pregnancy, and a 62% increased risk of birth defects overall. In 2011, a large study conducted by the U.S. Centers of Disease Control and Prevention (CDC) and the Slone Epidemiology Center in Massachusetts, reported a two-times increased risk of cleft palate birth defects among children exposed to Zofran during the early stages of pregnancy, when a developing fetus is most susceptible to harm. As parents across the country become aware of the potential for Zofran use in pregnancy to interrupt fetal development and cause birth defects in babies, a growing number of Zofran birth defect lawsuits are being filed against GlaxoSmithKline. All of the product liability lawsuits involve similar allegations that GSK failed to adequately warn consumers and medical professionals about the potential for Zofran to cause serious birth defects in babies when used off-label as a treatment for morning sickness in pregnant women. In August 2012, the U.S. Department of Justice filed a complaint against GSK for allegedly marketing Zofran as an off-label treatment for pregnant women, which is illegal, and the drug maker was ordered to pay $3 billion to resolve the claims. Alert: Due to statute of limitations, the time you have to pursue a Zofran claim is limited. Call us right away at 877-459-8260, email us at intake@monroelawgroup.com, or complete the form on this page now.